Dust and Vibration Do Matter! The Collections Management and Conservation team at the Canadian Museum of History is responsible for the preservation, care and treatment of the artifacts in the collection. This involves hands-on treatment to stabilize and repair artifacts, as well as preventative measures such as the monitoring and assessment of various environmental factors — including temperature, relative humidity and light, and their impact on the collection. The dismantling of the Canada Hall and construction of the new Canadian History Hall poses some unique collections-care challenges, not only for the objects being removed, but also for the collections that will remain on display throughout the Museum while the new Hall is being developed. In an effort to fulfill our role as caretakers of the collection, the Conservation team has been involved in preparations for construction of the Canadian History Hall. Two key areas of concern were identified in relation to the project: increased levels of dust and the possibility of construction-related vibration. Dust and vibration are everyday realities in a museum — a visitor simply walking across a gallery floor will cause some vibration. And, as everyone knows, dust is a never-ending battle, even in your own home! Introducing a construction project into the mix is bound to result in higher levels of both. In September 2014, with the assistance of Paul Marcon from the Canadian Conservation Institute) and some specialized equipment borrowed from the Institute, we measured a baseline set of vibration levels in the Museum. This included vibrations caused by the movement of visitors through the galleries and by the building’s mechanical systems. 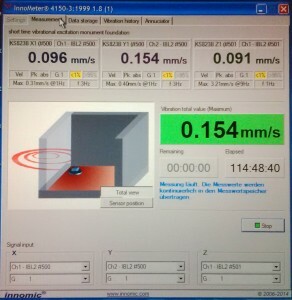 This baseline was then compared against measurements taken during a simulated construction-vibration test. 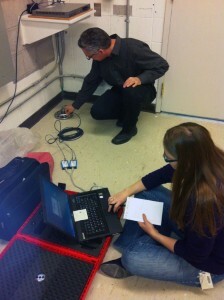 Paul Marcon and Rebecca Latourell installing the Innometer. Following closure of the Museum for the day, the onsite construction company removed several small pieces of the flooring in the Canada Hall using a larger chipper. The resulting vibration levels were measured in our temporary exhibition spaces, one floor below. The idea was to see how much vibration from the work above might travel down into the artifacts on display. Excessive vibration has the potential to cause artifacts to shift in their display cases, resulting in collisions or even in artifacts falling over — all of which can result in damage. Using standards developed by the mining industry, we concluded that the vibration levels we measured were quite low, suggesting that there would be minimal risk to the artifacts as a result of construction-related vibration. We have accordingly set acceptable vibration limits for the project and have ongoing monitoring in place to ensure that any new processes or equipment used during the construction process remain below those limits. So what about dust? Find out how we control this nuisance in part 2 of this blog post.